Let Amazing Adventures Travel take you to the "greatest shoal on Earth", South Africa's annual sardine run with the legendary Dive the Big 5! 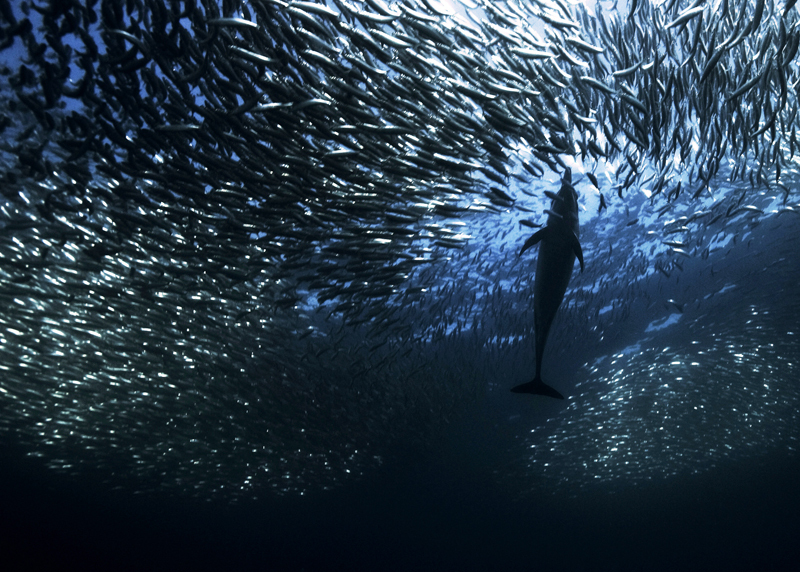 Every year, for the months of June and July, many millions of silvery sardines travel north from the cold southern oceans off South Africa's Cape Point, hugging the shore as they make their frantic run up the coastline. Visible even by satellite, these famous sardine shoals travel in seething masses and bait balls with hundreds of predators joining the party. You’ll be dropped right into the feeding frenzy as birds, dolphins, sharks, whales and game fish enjoy the all you can eat buffet. If the Sardines don’t pitch, all the other creatures such as whales, sharks, dolphins, penguins, seals, gannets as well as us divers, will be in the sea, waiting. For 2019, the sardine bases will be East London, Mpame and Port St Johns, which are the “safe bets” throughout the season to witness this spectacle. Spend 6 nights (5 sea days), 7 nights (6 sea days or 1 reserve day) or 10 nights (9 sea days or 1 reserve day) on this amazing adventure. Need some more wildlife? We can arrange a land-based safari in South Africa to hang with the Big Five or more high octane diving. Arrive East London Airport, at a time to be advised, own arrangements. On arrival you will be met at East London Airport, and transferred to Santa Paloma Guest Farm and Eco Centre. At 17h00 you will assemble in the bar at Santa Paloma to meet your fellow Sardine Run Expedition participants, guides and skipper for a full orientation of the following days Sardine Run Expedition. After, you will be kitted out with your dive gear, including reg, BCD, wetsuit, hoodies, booties, gloves and fins as required. A hot home cooked meal is served from 19h00. Overnight at Santa Paloma on a dinner and bed basis. A light breakfast consisting of coffee, tea, fruit juice, cereal, toast, condiments, fresh fruit in season & yogurt will be served from 06hh00 to 06h30. Before departing Santa Paloma for the launch site in East London harbour you will change into your bathing suits and into your wetsuit, which you strip to the waist. Don’t forget your fleecy lined wind jammer for the boat. You will need that! From Santa Paloma to East London harbour is about a 30 minute transfer. At about 07h30 we launch out of East London harbour for a day on the ocean looking for the shoals of Sardines, weather permitting. The sure tell tail signs that there are Sardines in the area are the sea birds, mainly Cape Gannets. They are always the first to spot the shoals and as soon as they do, they fly into the air, in their thousands, and start dive-bombing the shoal. The Gannets are far better at spotting the shoals of Sardines than any spotter plane or micro-light, in fact, that exactly what the pilots look for – Gannets!. At about 12h300, or whenever you are peckish, there is a packed picnic lunch consisting of assorted rolls, chocolate and nut trail mix, seasonal fresh fruit, juice, water and cold drinks to “sea” you through to dinner. When everyone on the boat has “has enough action”, or at about15h00 the boat heads back to East London Harbour where you will transfer back to Santa Paloma to freshen up, shower and relax before dinner. Dinner, a two course home cooked, hot meal is served in the dining room from 19h00. Overnight at Santa Paloma on a continental breakfast, packed lunch on the boat, dinner, and bed basis. Reserve “Safari” Day. Breakfast is served at 06h30 after which the group will be transferred to Inkwenkwezi Game Reserve which is about a 30 minute road transfer from Santa Paloma. On arrival at Inkwenkwezi Game Reserve at about 08h00 you will be introduced to your ranger and start your 2 ½ hour game drive in “open safari vehicles”. The early morning is the best time to be on safari as it’s still cool, and the animals are more active early morning and late afternoon when it’s cool. Only “mad dogs and Englishmen” venture out in the noon-day sun! After the safari you will then be introduced to Inkwenkwezi’ s Africa Elephants, and go for a walk with these magnificent beasts, in the African bush. An experience never to be forgotten! And if that’s not enough! After, you will have a hands on introduction and interaction to one of the most endangered species in the wild, the magnificent cheetah. After these two incredible “meetings” you will return to Santa Paloma for lunch, and to ponder what you have experienced during the past 6 days. Only in Africa. Overnight at Santa Paloma on a breakfast, lunch, dinner, and bed basis. After breakfast, at a time to be advised, you will be transferred from Santa Paloma, by a representative of Dive The Big 5, to East London Airport to be there one hour before the scheduled departure time of your flight, to check-in, before boarding. Add on a fun wildlife safari for the ultimate South Africa experience. We can customize the camps & lodges for you.